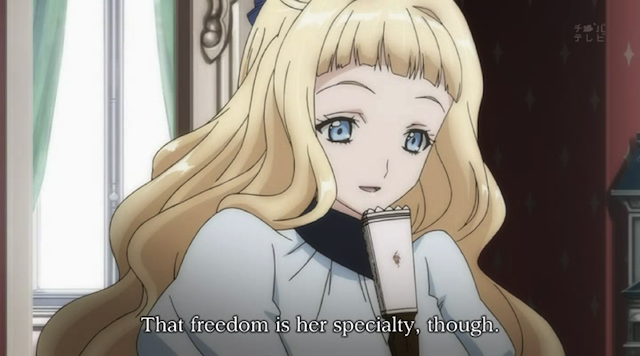 Camille Blanche expresses her admiration for Alice's relative freedom. Cats, prostitutes, and lovers. Episode 8 of Ikoku Meiro no Croisée (Crossings in the foreign labyrinth) seems to be a turning point in the series. As usual, the plot itself is minimal, and some time is spent on the difference between Japanese and French cultures, but there is an extraordinary development of character — both Camille’s and that of her sister, Alice. This was easily my favorite episode so far, and not just because we get to see Camille at three different ages. Claude Claudel plays with Camille Blanche as a child. Apparently Claude and Camille had an extremely warm relationship as children. One of the strangest parts of this episode was the way the notion of extra-marital lovers was raised several times. Alice introduces the French term amant, meaning a (male) lover, which is used also by Camille. 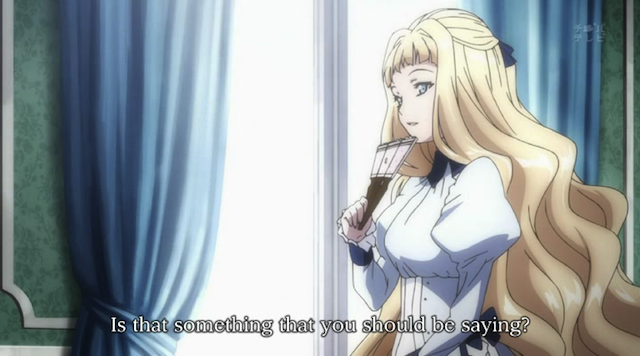 In the same scene shown in the screenshot above, Camille asks Claude to continue to “play with her” even if she gets married. One can argue that these were the words of an innocent child, but they also, with all of the talk in this episode of lovers, seem like foreshadowing of some sort. Claude and Camille might not become lovers, but, as I’ll get into below, their relationship seems to have lasting significance. And you don’t have to take my word for it; both Alice and Oscar give Camille and Claude (respectively) a hard time about their lasting affections. Oscar’s poorly concealed hints about a cat that Claude loved that ran away and lives at the Blanche house, only it isn’t a cat, were particularly hilarious. One of the two truly fascinating scenes in this episode. While Yune and Alice talk over tea in the garden, Camille meets Claude in a parlor upstairs. The thing that really impressed me here was that Camille asked a series of questions that have been nagging me (such as how old she is, and why she travelled to America). This was a brilliantly perceptive string of questions, and for a moment, I thought I was going to get some answers. When Claude said he didn’t know and didn’t care, it occurred to me that Camille knew that he would respond thus. 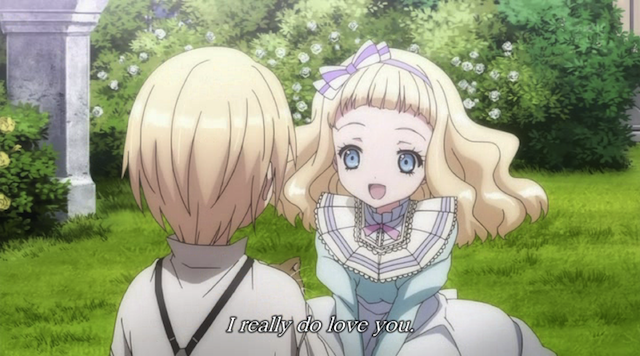 Camille also likens Yune to herself as a young girl, and insinuates that Yune is in love with Claude. Note: the further implication is that, at the least, Camille was in love with Claude as a young girl. There was a lot of tension in this scene, and Claude’s attitude (which we have seen on display all through the series so far) eventually causes Camille to leave him. This was one of those scenes that give you the feeling, that if one person just made the extra effort to say something, a far different outcome might have been reached. The next time we see Camille she actually looks kind of pissed (well, for her). Alice and Yune discuss fairytales over tea in the garden. 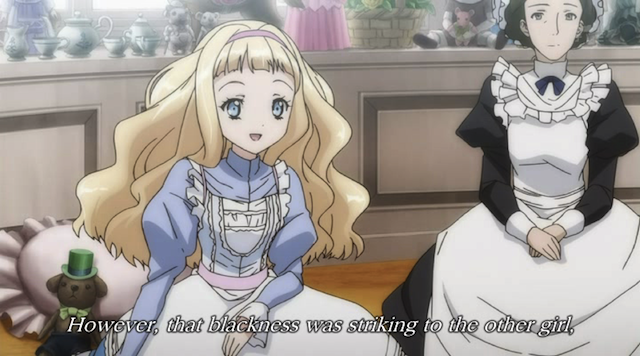 The culture clash portion was limited to Alice and Yune’s comparison of fairytales. Interestingly it, too raises the issue of women being allowed to select those to whom they shall give their love. Alice perhaps makes too much of the tale of Kaguya-hime, because women in Japan at the time were not accorded many liberties, but her outlook and value system is made clear, and she makes some valid points in comparing the relative passivity of Sleeping Beauty. This also feeds into the development of Alice’s character in this episode. Later in the episode there are flashbacks to Alice writing her own fairytale, which by itself shows individuality and imagination. Camille, not a child, but not yet a woman, listens to Alice tell a story. 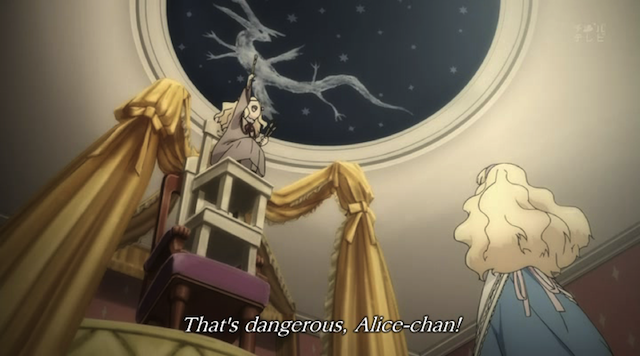 Alice illustrates her own story, by stacking up chairs, and painting a dragon on the ceiling. Camille, ever the proper lady, urges caution. 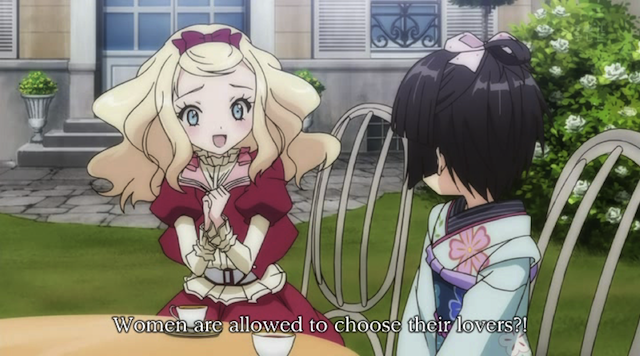 Camille tells Yune of Alice’s youthful indiscretions. Instead of staying inside the playroom and studying, as Camille had done, Alice tied ropes to the chairs and escaped out the window. As can be seen, she indulged her imagination, by not only inventing stories, but painting a dragon on the ceiling without permission. Camille makes it clear that she envies her younger sister’s free spirit. As she said in an earlier episode, Camille feels trapped like a bird in a cage, or perhaps as in this episode like a pet cat that isn’t allowed out of the house. She encourages Yune to continue as a friend to Alice so that Alice’s free spirit won’t end up trapped in the house. 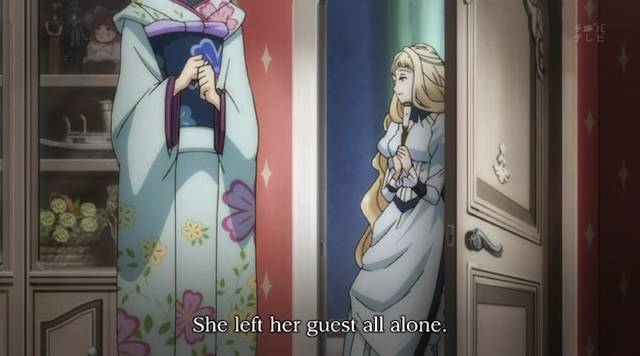 Although talking about Alice, Camille could actually be criticizing herself, since the last scene we saw her in was her walking away from Claude. 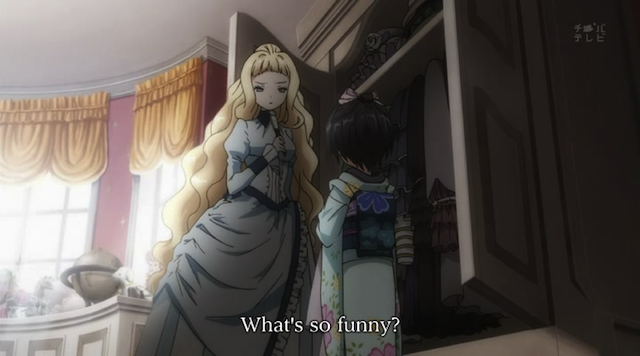 But there is another, darker, side to the scene during which Camille talks with Yune in the playroom that fascinates me. Alone with Yune, Camille seems moodier: sterner, and angrier. Yune likens her to a beloved older sister, but Camille refuses to acknowledge Yune as a younger sister. Although she attempts to be nice, and clearly likes Yune for her sister Alice’s sake, she is critical of Yune’s mannerisms and behavior, and is quick to scowl when she realizes that Yune is selecting a dress to please Claude’s tastes. I can't finish without pointing out how quick Oscar is to blow off work when someone waves a bottle of wine under his nose. It may be a good thing the old man has stopped working regularly in the shop. He doesn't seem to take it too seriously. This anime is becoming more and more compeling. Have you seen Emma Victorian Romance? If you like this one I think you’ll love Emma! Thank you, and thanks for reminding me about Emma. I haven’t seen it, but I would like to someday. I really enjoy the series that have a historical setting. Hmmm… then I think you’ll like the mangas drawn by Kaory Mori (Emma’s mangaka). She is the goddess and saint patron of historic drama. I readed Emma were she recreated Victorian England (she’s an anglophile and very serious at that). I’m reading her newest work which is one of the most beautiful works I’ve ever had the priviledge of appreciate: Otoyomegatari (The Bride’s Tale) with a setting in The Silk Road during the nineteenth century…. it has so much detail that it borders a cultural antropologic description (and with a charming plot to boot!). 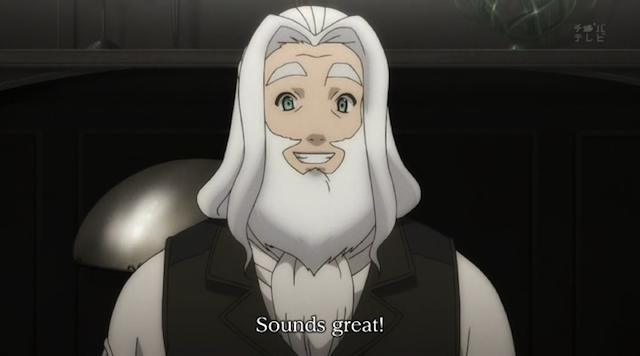 By the way “Abandoned Factory” is a Haibane Renmei reference? If so impecable taste, I love that show! Well now wait for the new episode of Meiro, looking forward for your review. Wow, something set on the Silk Road sounds interesting.